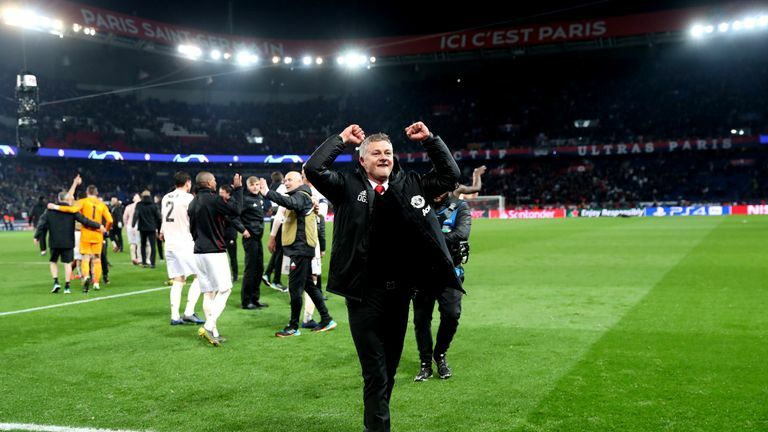 Ole Gunnar Solskjaer insisted Manchester United can "go all the way" in the Champions League after his side's historic 3-1 win at Paris Saint-Germain on Wednesday. Having been written off in their last-16 tie after a 2-0 first-leg defeat to the French champions three weeks ago, United became the first team in Champions League history to qualify for the next round having lost the first leg of a knockout match at home by two or more goals, sensationally beating PSG 3-1 at the Parc des Princes to progress on away goals. When is Champions League draw? 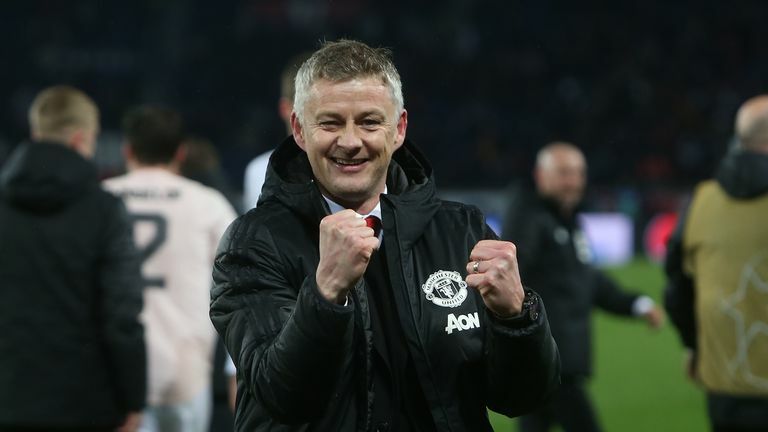 Two goals from Romelu Lukaku and a late, controversial Marcus Rashford penalty sent United through to the quarter-finals for the first time in five seasons, with an elated Solskjaer adamant there is even more to come from his side. "We always believed," Solskjaer said. "The plan wasn't about having the ball and outplaying them, if you give this team too much space and time they can hurt you. "You saw a couple of times in the first half when we missed out defensive shape. The plan was to be in the game with five minutes to go and it worked. Should Manchester United have been awarded the VAR penalty tonight? "I have got some fantastic memories, and that's what it gives you. It is special when you are a coach, doing it with your staff and the players. The dressing room was absolutely unbelievable, just to see the whole club together, with owners, ex-players, former managers. "We can go all the way. Of course we fancy ourselves. We have to wait for the draw. We had loads of injuries and suspensions but that was maybe a good thing here today, as we had a fresh team with lots of energy. We knew we had to defend and be humble enough to work hard. All the teams that are through are quality teams." Since Solskjaer's first match in charge on December 22, only Manchester City (15) have won more matches in all competitions than United (14) among teams in the top five European leagues, with this latest feat intensifying speculation caretaker manager Solskjaer will get the job on a full-time basis sooner rather than later. Solskjaer, though, would not be drawn on such talk. Should Ole get the job? John O'Shea told The Debate that he expects Ole Gunnar Solskjaer to get the Man Utd job on a full-time basis after Wednesday's stunning PSG win. "He will be the next United manager," said the former United defender. "Whether they do it now or in the summer, he will be the next manager. He's writing himself in the history books again. I think he will have the contract signed when they touch down in Manchester!" "I am planning, with the club, for the future," Solskjaer said. "It does not matter if I am here or not. I am still giving my advice and opinions for next season. I am a supporter as well, and I want the best for Man United. "I keep doing this job as best as I can every single day and we will see where it takes us. It has been a fantastic time with the players, with the staff I have got. I am just going to enjoy this job as long as I have got it. If it is another two months, three months, then I am going to enjoy it. I am going to smile." The penalty that gifted United the chance to win the tie came after referee Damir Skomina adjudged Presnel Kimpembe to have handled in the penalty area, having watched the incident on the pitch-side screen. Solskjaer, though, insisted he is yet to have seen the incident again. Neymar took to Instagram to rage about the penalty that knocked PSG out of the competition, writing: "This is a disgrace, they put four people that know nothing about football in charge of looking at the replay for VAR. There is no penalty. How can it be a handball when it hits his back! Go **** yourselves!" "I hope it is the right one," Solskjaer said. "I didn't see it. I was just helping the referee to calm my staff down, but there is nothing we can do about it now. They say it was the right decision." The late VAR penalty decision was as controversial as it was decisive with Neymar taking to Instagram to express his disbelief at the awarding of a spot kick. He said: "There is no penalty. How can it be a handball when it hits his back!" Can Utd, Spurs face each other? The key moment in the match was the late VAR-awarded spot-kick, but was it the right decision? Both Joleon Lescott and John O'Shea thought so. 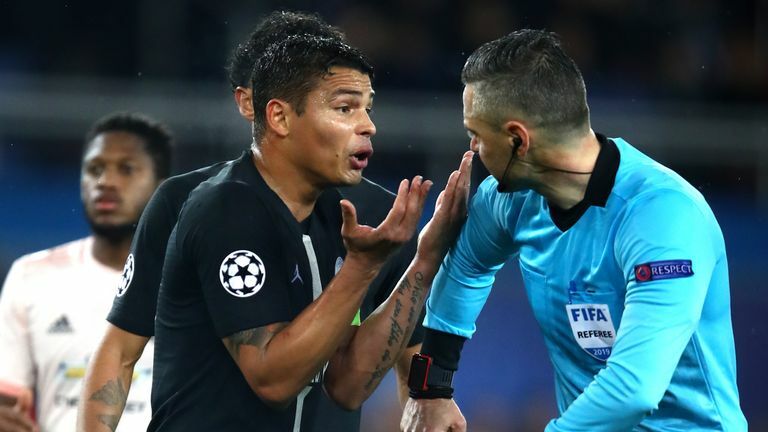 "It is a penalty and the fact that the referee has been able to go and view it again and make that decision, he seems to have made the right decision. I do not think many people will argue it was not a pen, but I would feel hard done by," the former Man City defender told The Debate. "He [Presnel Kimpembe] has gone a bit unnatural in how he has turned in the air to block it," was O'Shea's view of the incident. PSG coach Thomas Tuchel meanwhile said he was still an advocate of VAR despite the late decision and was also left stunned by his team's surprise exit claiming Manchester United progressed to the next round without attacking. "They had three goals without attacking, without creating a chance. It's hard, maybe impossible to analyse this," he said.